Happy New Year! Here it is, my new 2013 goals poster. I started this tradition last year as a way to visually see what I wanted to accomplish. Looking back at 2012, I give myself credit for making many, ok some, of the goals happen: blog everyday for a month, check – be creative on purpose, yup – drink tea, yes indeedy. And yet so many of the goals went undone. I only made bread once (and I’m counting naan as bread here), I still seem to have a hard time believing the best in people, and I never wrote a single letter. I’ll be honest, looking at the phrase “This is going to be an amazing year!” makes me wince now. Oh 2012 was many things, but amazing is a s-t-r-e-t-c-h. Truthfully, the word that best summarizes 2012 is scary. My dad had a heart attack in April and was taken, again, to the hospital in October. My parents moved into a new house before their old house sold. I left a job that I enjoyed to pursue photography full-time. My car was involved in a hit and run (while it was parked)! A crazy man approached me in a store and said very hateful things to me – very loudly. Luke (my dog) ate something on Christmas day that made him quite sick. And Newtown happened. So yeah, scary fits. But, I’ll be fair to 2012 and say that despite its scary dramaticness, things worked out. My dad recovered from his heart attack without any heart damage. My parents house sold within 2 months of being on the market. I have been busy-busy-busy with family shoots and I have booked several weddings for 2013 (along with being published and even more exciting news I’ll share soon). Two angels (as I call them) saw the hit and run, took a picture of the driver’s license plate (I love iphones!) called 911 and waited for the police to arrive. The crazy man didn’t have a gun and didn’t physically harm anyone (that’s all I got on that one). Luke recovered with a capful of peroxide that I forced him to swallow. And Newtown, well that’s still a hard one for me. After writing that last paragraph I can see very clearly now that right in the midst of the scary life events, God has been very present and has provided abundantly. And for that I am extremely thankful. The one word I picked for 2013 is fearless. So much of 2012 was spent being afraid/uneasy that I’m so ready to put that behind me and fearlessly move ahead. 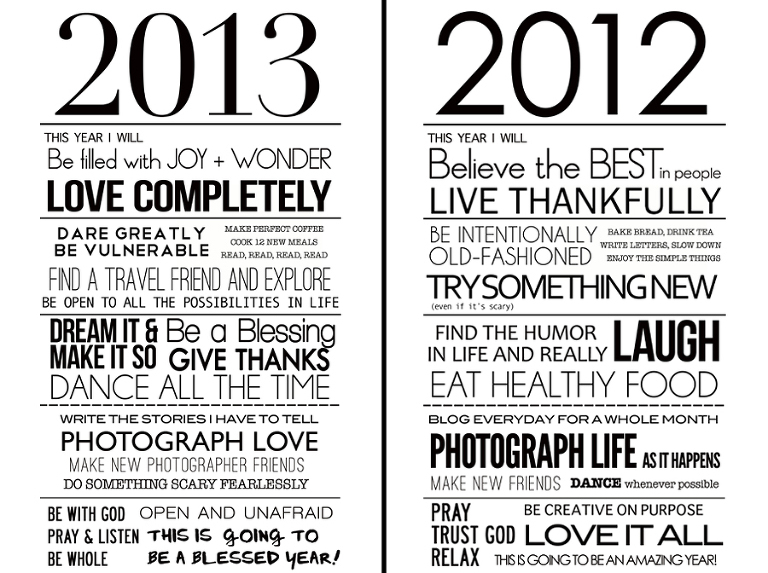 So here’s to a new start, a fresh and fearless 2013! One thing I know for sure is that it will be a blessed year.